Melbourne Rebels coach Dave Wessels has made four changes to his match-day 23 ahead of their Super Rugby against the Stormers. The Melbourne Rebels have outclassed the Sunwolves in their Super Rugby encounter in Melbourne. Herman Mostert highlights FIVE talking points after Week 5 of the 2019 Super Rugby competition. The Sharks have snapped their two-match losing streak with a comfortable win over the Rebels in a Super Rugby encounter at Kings Park in Durban. Melbourne Rebels skipper and Wallabies fullback Dane Haylett-Petty is set to miss six weeks of Super Rugby with a ligament problem. The Melbourne Rebels have made several changes to their team to face the Sharks in Durban. 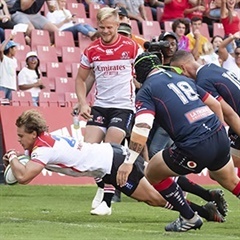 A rampant second-half display from the Lions saw them beat the Rebels in a thrilling Super Rugby clash at Ellis Park on Saturday. Lions coach Swys de Bruin has named his team for their Super Rugby encounter against the Melbourne Rebels at Ellis Park. Wallaby Reece Hodge has been picked on the wing for the Rebels ahead of their Super Rugby clash against the Lions. South Africa's Egon Seconds will referee Saturday’s Super Rugby clash between the Lions and Melbourne Rebels at Ellis Park in Johannesburg.